Earlier in the school year, on a nice day, I stopped by Washington-Lee High School in Arlington to see how the new bike racks they installed were doing. 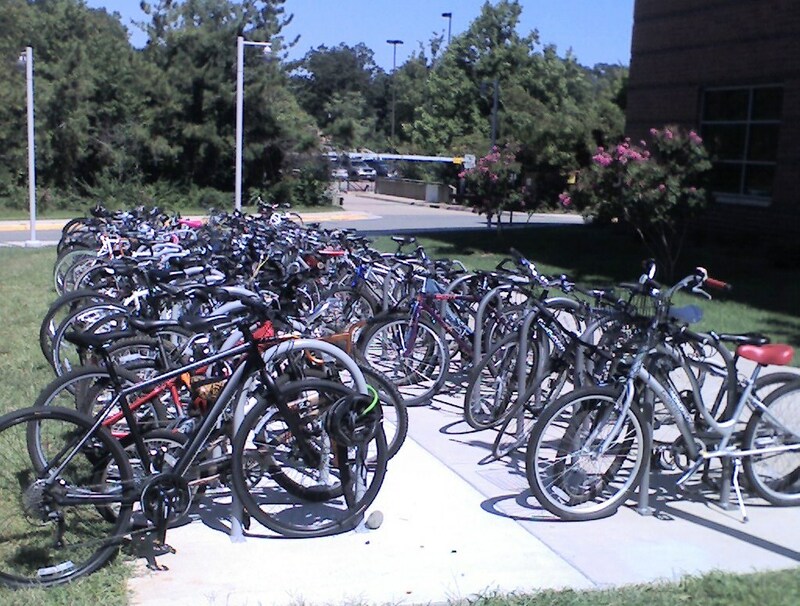 Last spring they doubled the number of bike racks from 23 to 46, which increased capacity to 92 bikes. It's a good thing they added the new racks. On September 12 I went past the school and counted 59 bikes locked up in them. This represents about 2.6% of the student population. Including faculty and staff reduces that percentage somewhat. 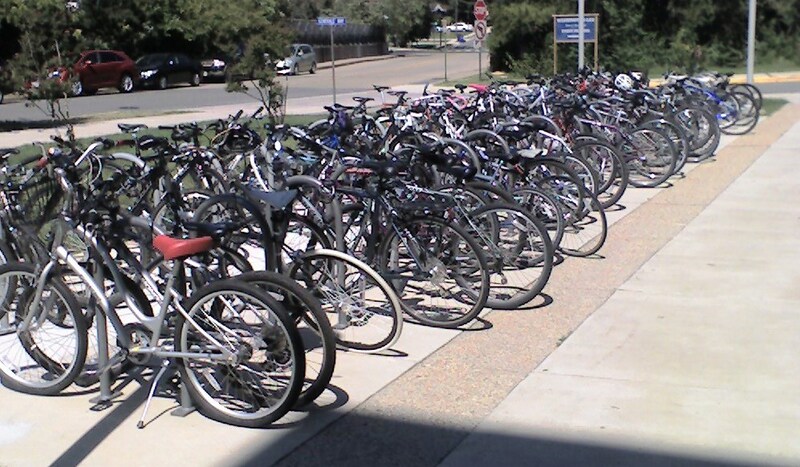 I did not look around the school to see if there were more bikes parked elsewhere. That's not bad, but it would be great to have them max out and have to add even more bike parking. 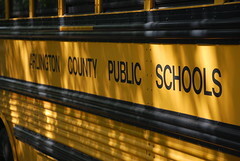 My hometown of Arlington, VA has been embroiled in a minor controversy regarding bus transportation for school students since a few weeks prior to the start of school. The school district made changes to bus routes and reduced the number of students eligible to ride buses by more rigorously enforcing the 1-mile and 1.5 mile walk zones. 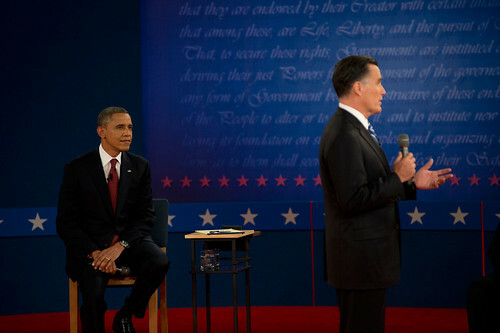 Details of the controversy can be Googled, so I won't go into the details here. My point of view, and this blog post, have to do with the overall transportation plan for Arlington Public Schools. Transform to Sustainability has previously written about LEED certifications and the work required to obtain them. This guest post by Noelle Hirsch touches on the benefits of LEED certification as it relates to several states within the U.S. -- not surprisingly, thousands of dollars can be saved over time from just a few simple green tune-ups on an old building. Noelle claims to write for an expert construction management website called www.ConstructionManagement.net (although I have had trouble verifying this claim). As the effects of climate change have become increasingly apparent in recent years, the importance of reducing carbon emissions for environmental health has been espoused in all forms of media. While many people today acknowledge the environmental necessity of raising energy efficiency, most individuals are still unaware of how sustainable construction and building maintenance can substantially reduce power costs. Yet, an increasingly wide body of research is finding that by following the standards of The US Green Building Council's LEED program, building managers and residential owners can save thousands of dollars by building with green principles in mind or retrofitting existing structures.